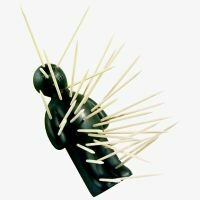 Make your next party painfully amusing by inviting OUCH!, the voodoo-it-yourself toothpick holder. Perfect for finger food, and jump-starting the good times. Two fashionable colours in elegant clear diner-style packaging. Ouch will add oomph to the plainest of table settings! Available in BONE or CHARCOAL colour - PLEASE SPECIFY COLOUR YOU PREFER, AT CHECK OUT.